The Griz-Saw's triple ground diamond-cut blade penetrates the toughest materials including wood, bone, plastic/PVC and drywall. This compact fixed blade saw is perfect for all outdoor activities as well as for home use. The T-Shaped handle allows straight wrist cutting. This reduces muscle fatigue and allows you to cut comfortably from any angle. The Griz-Saw&apos;s triple ground diamond-cut blade penetrates the toughest materials including wood, bone, plastic/PVC and drywall. 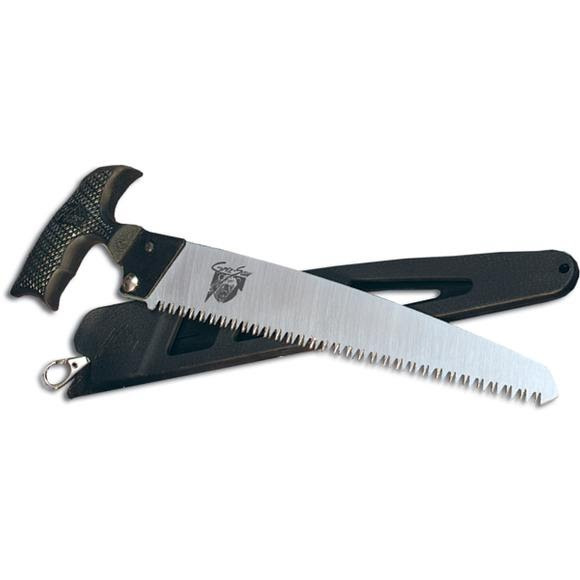 This compact fixed blade saw is perfect for all outdoor activities as well as for home use. The T-Shaped handle allows straight wrist cutting. This reduces muscle fatigue and allows you to cut comfortably from any angle. The rubberized Kraton handle with Tri-Mond texture pattern provides a safe, secure grip, even when wet. Includes quick-release Delrin sheath with swivel-clip attachment. Perfect choice for hunters, campers and backpackers.